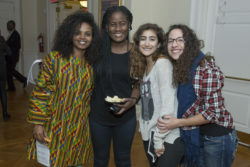 Weyni (left) with I-House friends. Weyni Berhe was born in a war zone in Ethiopia. Her parents were guerrilla fighters resisting the communist Derg Regime and the Territorial Army that ruled Ethiopia from 1974 to 1987. They went on to serve as General and Colonel in the current Ethiopian government. As an undergraduate at the College of Wooster in Ohio she served as a Resident Assistant for an international dorm, facilitating programs for more than 400 students. She also worked at the Permanent Observer Mission of the African Union to the UN. She chose to live at International House to continue exploring and developing her leadership skills – and herself. “I see the concept of I-House as a platform to question who you are and how you fit within the global community,” she explains. Her participation in the Women’s International Leadership program at I-House is part of that exploration. 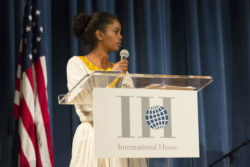 In addition to the fellowship providing the financial means for her to stay at I-House, the program has helped broadened her views on leadership. She admits that she was skeptical of the need for a specific program for women leaders when first applying, but now describes the program as one of the highlights of her I-House experience.